This exhibition includes work by 3 photographers with a Glasgow focus which deploy various documentary approaches from portraiture, landscape to recording people and places. Lisa Boyd’s ‘Glasgow Mods’ is a series of large full figure portraits of individuals captured in ad hoc natural set-ups at clubs – her interest is in those with a long running association with the mod lifestyle and those for who being a mod has always remained a fundamental part of them. Martin Hunter’s Forth & Clyde captures an interzone between past and present, the dereliction of industry and the reclamation of nature. 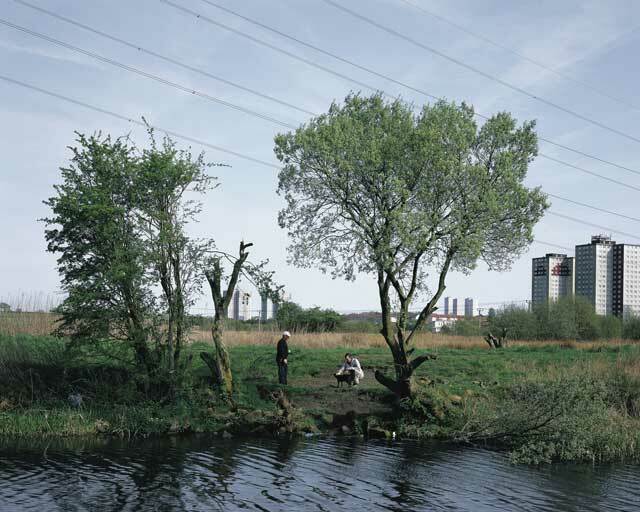 In this landscape series, Hunter searches off the beaten track along the once thriving canal route that linked the River Forth and the River Clyde, intersecting with the pathways along the River Kelvin, “places left behind by recession, over-run by nature, and occasionally-inhabited by groups of men who seek the outdoors for a brew and a blether” (Document Scoltand). Allan Bovill’s ‘Steamies’ captures the last days of the public wash-house in Glasgow, captured in 1986. Glasgow had many public laundries and bathhouses which were established in the 18th Century and operated until the mid-1990s, when the ‘steamies’ closed their doors. The council-run laundries provided washing facilities and baths when few houses, particularly in the 19th Century, had either. Perhaps more significantly, they provided an important social focus and community for many local people. Martin Hunter from the series 'Forth & Clyde', 2013. Courtesy Street Level.